Poised to begin their undergraduate studies back in the U.S. in the coming year, students in Yeshiva’s S. Daniel Abraham Israel Program got some advice about working in Israel straight from the source: YU alumni who have made aliyah [immigrated] to Israel. Over 300 students filled the auditorium on Yeshiva University’s Gruss Campus in Jerusalem for the career fair, co-sponsored with Nefesh B’Nefesh, on March 14. Rabbi Ari Solomont, a native of Boston, has been named director of the Yeshiva University S. Daniel Abraham Israel Program. The program enables hundreds of young men and women every year to incorporate their study at more than 45 participating yeshivot and other educational institutions in Israel into their college years, enhancing their academic experience. The program is supervised by the Israel Program staff at the YU campus in Jerusalem. More than 60 people from 25 Israeli yeshivot and midrashot attended the final Mental Health Seminar of the year hosted by the S. Daniel Abraham Israel Program in May. 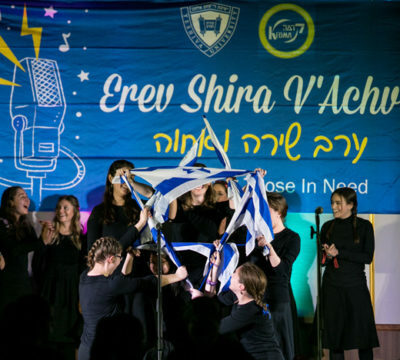 On the evening of January 14, more than 2,000 students, friends, and family participated in this year’s Women’s Choir Competition, “Kol Chatan V’kol Kallah,” co-sponsored by Yeshiva University and Kedma, an international student organization funded by United Jewish Appeal’s Partnership 2000 program. Mental health is a growing area of concern for college students, and students studying in yeshiva and seminary programs in Israel are not exempt, said Dr. Victor Schwartz, director of the Counseling Center at Yeshiva University during a special trip to Israel to educate the directors of seminaries and yeshivot about how to handle mental health problems. Mark Lehrman has been appointed director of YU’s S. Daniel Abraham Israel Program. Mr. Lehrman has been at the university’s Caroline and Joseph S. Gruss Institute in Israel since 1995 where he was most recently assistant director of admissions. In the past decade, he has led YU’s recruitment efforts in Israel and has helped bring about a significant increase in enrollment in the Israel Program.